8th Street Corridor Study - TADI - Traffic Analysis & Design, INC. 8th Street Corridor Study - TADI - Traffic Analysis & Design, INC.
8th Street is a 0.63-mile four-lane commercial highway corridor with five traffic signal from 6th Avenue West to STH 69. 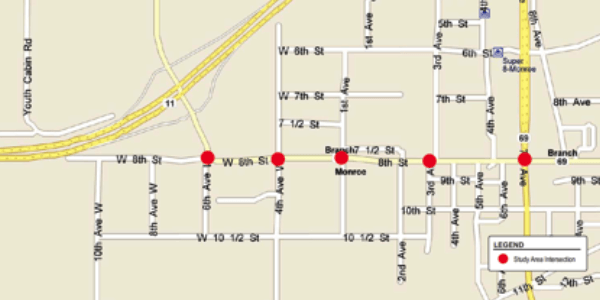 The City of Monroe planned to reconstruct the highway in Year 2016 and retained TADI to collect traffic volumes, analyze existing and design year traffic volumes, determine intersection improvements, and improve traffic signal operations along the corridor. Additionally, TADI prepared traffic signal design plans and signal timings for implementation.